READER COMMENT: Human to cat! 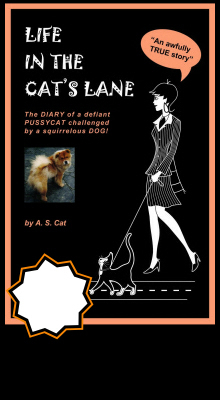 Life in the Cat’s Lane is attracting reader reaction from far and wide. Send us a reader review and you could receive a set of our gift-wrapped Pets Note Cards for free. Tell A. S Cat exactly what you think of his diary. Whether you loved or hated “his” book, have a go at writing up a review – as long as it’s no more than 150 words. Humorous ones which capture its zany tone are greatly encouraged! Just email your review to the author by clicking here to use our message form. This book is zany, creative and hysterically funny! I laughed out loud on more than one occasion. I especially loved the part where the Cat says: “It was DOG after all, but Dog as I’ve never seen Dog – drenched, drowned and soaked beyond recognition!” It was like the turning point for the cat, like seeing the real Wizard of Oz! A tongue-in-cheek literary effort teetering between catastrophe and triumph! Funny and irreverent! Book Reviewer Sheena Stratton claimed that A.S. must be “challenging to be the next Bridget Jones,” to which the feisty feline is alleged to have meowed in reply, Certainly not! There’s no challenge where success is assured. A fantastic lot of drivel…I loved it! A book you can dip into and enjoy! I simply sat there reading it, laughing like an idiot! I can relate to your troubles as they did bring back painful memories when, 11 years ago, my owner suddenly brought home a small human. Things have, for me, never been quite the same again. Grrr! A.S. Cat’s diary has at least one breed of pedigree cats “spitting slugs,” if heated comment from several Abyssinians on the internet is anything to go by. While an online cat crit from one Isis D’Lynx gave the self-made moggy’s book a basic paws up, it still ended on somewhat of a twitchy note. Said puss concluded her otherwise favourable remarks by castigating A.S. for his “misguided assumption that all pedigree cats are over bred and useless.” Which in turn created a furore of frantic meowings on the Isis Meows blog giving a voice to Abyssinians worldwide. However, a sorrel Abyssinian Sen-Chan gave A.S. a paws up, indicating the following to his owner for internet posting, namely: “It was a good read despite the horrors it depicted. I did enjoy the monthly overview and have decided to make ‘Purr Maximus’ into one of my favourite expressions! Note: If YOUR cat has any comments to make, please email them to the author HERE. What a wonderful book this is! At first I was skeptical of this first paw account of life with a Chow Chow and a pretty poor excuse of an owner but soon I found myself really enthralled by it. You certainly get a good look at the workings of A.S. Cat’s brain as he works out how to use the invading foe (a.k.a. Dog) to his advantage. Not easy when faced with a dog who seems to be at least part cat - I mean it’s curious and very unpredictable for a member of the canine species! Though not once do you feel the need to pity Cat (and a good job too -- cats HATE pity). After all if Sooty had only but trained his alleged owner properly to start with, none of this would have happened surely. Having pawed my way through the book, I feel I have learnt a number of valuable life lessons though. Firstly, to extract a vow from Mummy that I can have her committed if she ever so much as mentions the thought of bringing home a Chow! Secondly, that given a good deal of training, even the most scurrilous of owners or dogs might eventually be reformed. Lastly, I am far more appreciative of Mummy now, seeing that she came to me well trained! The only bone I have to pick with A.S. Cat is over his misguided assumption that all pedigree cats or house cats are over bred and useless. This is far from the truth, especially where Abyssinians are concerned! A wry look at day-to-day life in a Superior Cat’s home when invaded by a usurper with no respect for tradition. Life in the Cat’s Lane is entirely from the cat’s perspective. His opinions on life, inter-animal and inter-human relationships and the required levels of “owner” training in a domestic environment are sharp and to the point – and wonderfully biased.